The authors of this package acknowledge the support provided by members of the Northeast Ohio Cohort for Atherosclerotic Risk Estimation (NEOCARE) investigative team: Claudia Coulton, Douglas Gunzler, Darcy Freedman, Neal Dawson, Michael Rothberg, David Zidar, David Kaelber, Douglas Einstadter, Alex Milinovich, Monica Webb Hooper, Kristen Hassmiller-Lich, Ye Tian (Devin), Kristen Berg, and Sandy Andrukat. This work was supported by The National Institute on Aging of the National Institutes of Health under award number R01AG055480. The content is solely the responsibility of the authors and does not necessarily represent the official views of the National Institutes of Health. The goal of the projects R package is to provide a set of tools that support an efficient project management workflow for statisticians and data scientists who perform reproducible research within team science environments. The projects package is built upon some existing tools for reproducible research, particularly RStudio, the R integrated development environment in which it dwells, and R Markdown, the file structure that allows users to assemble datasets, to perform analyses and to write manuscripts in a single file. The projects package is oriented towards efficient and reproducible academic research manuscript development and incorporates protocol and analysis templates based on widely-accepted reporting guidelines (viz., CONSORT and STROBE). When used on a shared file system (e.g., a server), the projects package provides infrastructure for collaborative research: multiple researchers can work on the same project and keep track of its progress without having to request updates. Organization and management functionality, including the ability to group, archive and delete projects. At its outset, the projects package creates a folder called /projects in a user-specified location. This directory will contain all research projects created and maintained by the user. The /projects folder will also contain a relational database of the research projects and the persons who contribute to them. The database allows for users to input important metadata about the projects and authors, including stage of research and contact information. Once this higher-level folder is created, users run R functions to create projects, each of which is given its own folder. New project folders automatically include aptly named subfolders and templates in order to guide the project workflow (e.g., a “data” subfolder; a “datawork” R Markdown template). Right away, users can begin working on the research project and edit the metadata of the project itself and its authors. To lessen the burden of the mundane details of manuscript writing, the projects package can output lines to the console that, when copied into an R Markdown file, generates a title page with all relevant authorship information of any given project. Finally, since users may create dozens of projects over time, users can run functions to organize their projects within grouping subfolders of the main /projects folder. There exist today widely available tools that aid with reproducible research, such as R and other statistical programming languages, that allow for precise documentation of some of the most detail-oriented portions of a project workflow. Researchers can distribute their code scripts alongside their results in order to communicate the integrity of their data processing and analysis. Unfortunately, statistical programming languages per se only contribute to research reproducibility insofar as individual statistical programmers are able (1) to use these tools effectively and (2) to integrate their own use of these tools with their collaborators’ work—which may not necessarily be oriented towards reproducibility. Although researchers of different disciplines may operate in nuanced ways, there are aspects of the project workflow that are common to most investigations. First, studies are conceptualized and designed according to a protocol that details the research questions and planned analyses. Data are collected, manipulated (or “tidied”) in order to make data analysis possible. The results of the analyses are compiled into a report, and ultimately an academic manuscript is drafted and submitted for wider distribution. 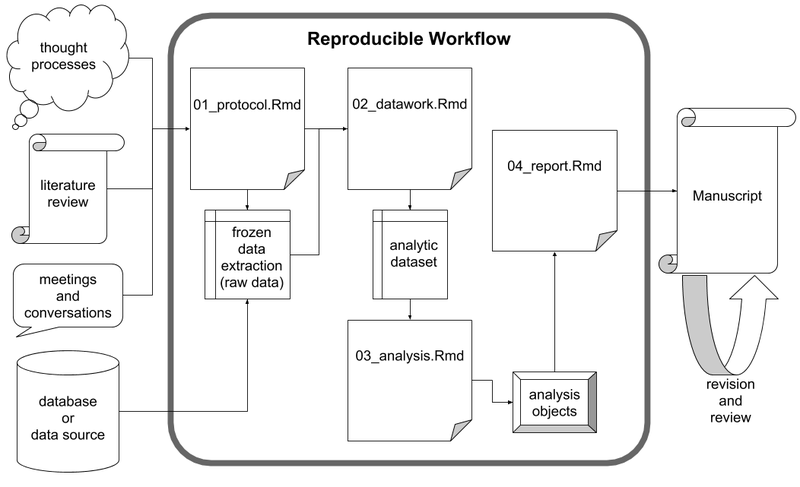 When navigating this workflow, researchers strive for reproducibility wherever possible, but especially during the intermediate, data-focused phases of the workflow. Readers of the final manuscript should have access to the study data in its most unrefined state possible: a frozen dataset. A frozen dataset is almost invariably a digital file or set of files that standard data analysis software can process. Whereas study data may have been initially collected in a non-digital manner, a frozen data set represents the study data’s earliest state of simultaneous digitization and consolidation. From this point forward through the reporting stage, total reproducibility is expected. Thanks to modern data analysis via statistical programming languages, a reader should be able to exactly reproduce all data-derived results from the frozen data set alone. With access to the exact scripts the researchers used to produce their results, readers can scrutinize every function call performed on the frozen data set and its descendants. The middle stage of the assumed study workflow can be performed with near perfect reproducibility, but the beginning and ending stages may not. Researchers cannot document every thought process, literature probe and informal conversation that contributes to the development of the initial study protocol, but they should strive to document it as meticulously as possible. Databases tend to be dynamic such that a given analytic data set is merely a snapshot in time. As for the final stages of project development, journals require that manuscripts adhere to specific and unique stylistic guidelines and that they be digitally submitted with file types that are not independently conducive to reproducibility (e.g., .pdf). For instance, even as RStudio supports the creation of submission-ready documents directly from frozen datasets, the vast majority of project teams include experts who do not use RStudio; therefore, the collaborative manuscript editing process ultimately takes place in an environment (e.g., Microsoft Word) that only supports total reproducibility with extraordinary effort. In light of these realities, researchers must do their best during manuscript creation, keeping the process in reproducible environments for as long as possible and otherwise documenting significant changes and alterations. All projects that the user creates with the projects package—as well as its infrastructure—reside in a main folder called /projects. Users need not manually create this directory, and in fact they are encouraged not to manually manipulate any folders that the projects package involves. Instead, users run the function setup_projects(), providing the full file path of the directory in which the user wants the /projects folder to reside. Data about authors, institutional and/or department affiliations and projects are stored in .rds files within the main /project directory, so that the user only needs to enter these details once (unless, for example, a co-author changes their name or affiliations). These data are also used to assemble title pages of reports, with automatically generated author lists and lists of author affiliations. We provide a complete example of this process below in the Demonstration section below. The main metadata tables accessible to the user are projects(), authors() and affiliations(), via functions thusly named. Two additional tables are internally created to keep track of associations between authors and projects and between authors and affiliations (see the Internal Tables section). id – an identification number, specifically an integer, unique among the other projects. This number can be used whenever needing to identify this project within projects package functions. title – the title of the project. A nonambiguous substring of title (i.e., a substring that does not match any other project) can be used whenever needing to identify this project within projects package functions. This value is also printed in the YAML header of the “protocol” and “report” .Rmd templates that are automatically generated upon project creation. short_title – an optional unique nickname for the project. A nonambiguous substring of short_title (i.e., a substring that does not match any other project) can be used whenever needing to identify this project within projects package functions. This is useful if users cannot remember the long, formal project title nor the project id. current_owner – the id of the author who is responsible for taking action in order that work on the project may proceed further. status – a short description of the status of the project. For example, it may elaborate on the value of current_owner and/or stage. deadline_type – a simple description of the meaning of the date contained in the next field, deadline. deadline – a date indicating some kind of deadline whose meaning is described in the previous field, deadline_type. stage – one of six predefined stages of project development that the project is currently in: c("1: design," "2: data collection," "3: analysis," "4: manuscript," "5: under review," "6: accepted"). path – the full file path where the project folder is located. corresp_auth – the id of the author who should be contacted for any correspondence relating to the project. This author’s name will be especially marked on automatically generated title pages for this project, and his or her contact information will be especially displayed there as well in a “Corresponding Author” section. creator – the id of the author who initially created the project, or the value of Sys.info()["user"] if the author who ran new_project() did not enter a value. id – an identification number, specifically an integer, unique among the other authors. This number can be used whenever needing to identify this author within projects package functions. given_names – the given name or names of the author. A nonambiguous substring of given_names (i.e., a substring that does not match any other author) can be used whenever needing to identify this author within projects package functions. This is included in the automatically generated title pages of the projects associated with this author. last_name – the last name or names of the author. A nonambiguous substring of last_name (i.e., a substring that does not match any other author) can be used whenever needing to identify this author within projects package functions. This is included after given_names in the automatically generated title pages of the projects associated with this author. title – the job title of the author. degree – the abbreviation(s) of the author’s academic degree(s). This is included after last_name in the automatically generated title pages of the projects associated with this author. email – the email address of the author. This is included in the “Corresponding Author” section of the automatically generated title pages of projects whose corresp_auth field contains this author. phone – the phone number of the author. This is included in the “Corresponding Author” section of the automatically generated title pages of projects whose corresp_auth field contains this author. id – an identification number, specifically an integer, unique among the other affiliations. This number can be used whenever needing to identify this affiliation within projects package functions. department_name – the department name of the affiliation. A nonambiguous substring of department_name (i.e., a substring that does not match any other affiliation) can be used whenever needing to identify this affiliation within projects package functions. This is included in the affiliations section of the automatically generated title page of projects associated with authors with this affiliation. institution_name – the name of the overall institution of the affiliation. A nonambiguous substring of institution_name (i.e., a substring that does not match any other affiliation) can be used whenever needing to identify this affiliation within projects package functions. This is included after department_name in the affiliations section of the automatically generated title page of projects associated with authors with this affiliation. address – the address of the affiliation. This is included after institution_name in the affiliations section of the automatically generated title page of projects associated with authors with this affiliation. It is also included in the “Corresponding Author” section of the title page when a project’s corresponding author has this affiliation as his or her primary (i.e., first) affiliation (see the Internal Tables section). In keeping with relational database theory, there are two .rds files that keep track of the many-to-many relationships between projects and authors and between authors and affiliations. Each has two columns, id1 and id2, that contain the id numbers of these items. Each row of this table describes an association. Furthermore, the projects package keeps track of the order in which these associations appear so that the automatically generated title pages list authors and affiliations in the correct order. Users are able to run functions to reorder these associations as needed. The included subfolders serve to organize the project, while the .Rmd files are templates that facilitate the user’s workflow. The goal of the projects package is to provide a comprehensive set of tools managing project files in a way that is self-contained in R and independent of the underlying operating system. On a daily basis, researchers make, move, copy, delete and archive files. Through the projects package, researchers can perform all these actions in an organized manner with an automated file structure. In fact, users are advised not to manipulate the /projects folder and its content with their operating system, so that the package does not lose track of these files. Multiuser application of projects requires a server or an otherwise shared directory where multiple users can access the /projects folder. File-managing functions—along with all functions—are demonstrated below in the Demonstration section. The projects package supports style customization of manuscripts through cascading style sheets (CSS). When a project is created, a file called style.css is created alongside the .Rmd files in the /progs folder; users can customize their protocol and report by editing this file. Users can also create their own template files for the datawork, analysis, and manuscript .Rmd files. Lastly, the user is given the option to make these .Rmd files BibTeX-ready for streamlined bibliography creation. There will be a future vignette on these supplemental topics. Upon installation, the projects package must be set up using setup_projects(). The user is to input the file path of the directory wherein the /projects folder is to be located. As the message suggests, it is in the user’s best interest to add affiliations, followed by authors and projects. This affiliation has been successfully added to the “affiliations” table in the projects relational database. The next code chunk creates a few more affiliations (output not included). Now we are ready to add authors to the “authors” table of the projects database. Notice that in creating associations between Scott Bug and his affiliations, we were able to enter both the id number of one of them (2) and a substring of the department_name of the other (“Physics”). Also notice that the email address was coerced to be lowercase. Now we’ll add more authors (output not included). Notice that since a creator was not specified, this field was populated with the value of Sys.info()["user"]. Among other files and folders, this line of code created the files 01_protocol.Rmd and 04_report.Rmd, which both include code to create a title page exhibiting a preformatted list of authors and their affiliations. Notice that the author order given to the authors argument in new_project() command has been preserved. Also notice that Scott Bug has been marked as the corresponding author, and his contact information has been included. When knitted, this will be a proper title page. When adding or removing affiliations/authors from an author/project, a one-sided formula is used: it must begin with a tilde ~, and elements are added with + and removed with -. Elements can be referred to by their id numbers or their names, as described above. #> title: "Cold Fusion Is Actually Impossible"
Here, the title and stage of the project have also been edited. Notice that the default behavior of edit_project() is to reprint the project title as well as the other elements of the title page. The user can then copy and paste this header into the 01_protocol.Rmd and 04_report.Rmd files. Also notice that the default behavior when adding elements is to place them before the last author (unless there was only one author). This occurs after elements are removed, as specified by any minus signs (-) in the formula. title: "Cold Fusion Is Actually Impossible"
If a project has already been created, it can be moved not with edit_project() but move_project(). Users can also copy projects using copy_project(); everything in the copy will be the same except its id, folder name (which, again, is based on its id), path (which, again, is based on its folder name), and the name of its .Rproj file (which has the same name as the folder name). Projects can also be archived; they are moved into a subdirectory called /archive that is at the same level as the project folder (/pXXXX) before it was run. If this /archive folder does not exist, it will be created. When a project is archived, it is no longer included in projects() output unless the user sets archived = TRUE. Lastly, affiliations, authors and projects can be deleted with the delete_*() functions. Deleting an author is complete: doing so removes the author from the creator, current_owner and corresp_auth fields of all projects. Furthermore, deleting a project also deletes the entire project folder. Use the delete_*() functions with caution. #> The above affiliation was deleted. #> The above author was deleted. #> The above project was deleted. The projects package provides a comprehensive set of tools for reproducible team science workflows. Efficiency in project management, including manuscript development, is facilitated by an internal database that keeps record of project details as well as team members’ affiliations and contact information. For manuscripts, title pages are automatically generated from this database, and a selection of manuscript outlines compliant with reporting guidelines are available in R Markdown format. We believe that the projects package may be useful for teams that manage multiple collaborative research projects in various stages of development. Baker, Monya. 2016. “1,500 Scientists Lift the Lid on Reproducibility.” Nature News 533 (7604): 452.